4 more days until Star Wars: The Force Awakens! It’s just getting closer and closer and the countdown until the big day continues. Continue the countdown with Bluestacks by taking a look at our featured Star Wars game for the day: Star Wars: Commander. 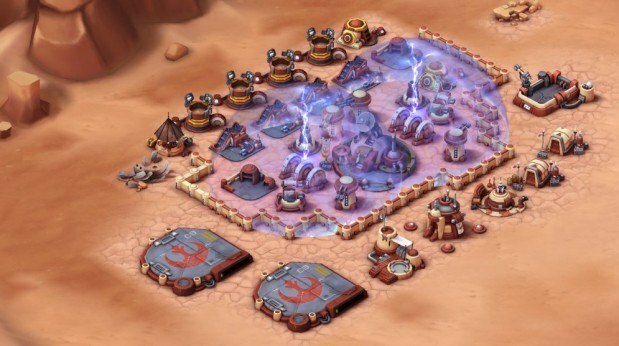 Star Wars Commander is a freemium (“Free Premium”) mobile strategy video game for iOS and Android, developed by Disney Interactive. Unfortunately, you have angered Jabba by defeating his gang of thugs . Now he is after you and the only way to fight him and his army is to form an alliance. Which side will you choose? Will you choose Darth Vader and fight as the Galactic Empire or will you go with your childhood classic rebel heroes, Han Solo and Princess Leia? Whatever you choose, you need build and defend your base and train your troops ain order to strengthen your territory. Think strategically and form smart alliances with players all over the galaxy. Connect with all your friends and band together or, even fight against each other. Wether you choose the light side or the dark side, you all share a common goal: conquer your enemies and secure your base. Watch your defense team strength and your strike team tackle forward. Train your troops towards specific tasks, use deflector shields, and fortify your base with turrets and other heavy artillery. Strategy and patience is key. Whew… Fighting Jabba, protecting your base, AND building a super star team is a lot of hard work and a very serious job. Take a little break in between your attacks and check out these 4 Star War videos for some comedic relief between your battles. Whether you decide to come to the dark side or rebel against the empire, a laugh wouldn’t hurt. 1. SNL skit. Watch the SNL cast audition for different Star Wars characters as celebrities! Let the force rage on, the Jedi only held me back anyway…. -2 winners will be selected by December 28, 2015. So stay tuned! Good luck!! May the 4th (day of the countdown) be with you ! !